This is a requested article, someone asked me to write specifically about lotus and the medial meniscus. When I do my unscientific polling in workshops, approximately 80% of those people complaining about pain in their knee, say that they experience inner knee pain. Approximately 10 – 15% complain about pain on the outside of their knee. The remainder usually complains about pain running through the centerline of their knee or around the kneecap. All three areas express stress in the knee in different ways. Inner knee pain seems to be the most popular and is almost always associated with the leg being in a half or full lotus position. My statistics are only my own personal and simple observations turned into a working hypothesis. It seems to me that the most common cause of pain on the inside of the knee is compression of the medial meniscus. I say this cautiously because I know that not all pain on the inside of the knee is going to be the medial meniscus. 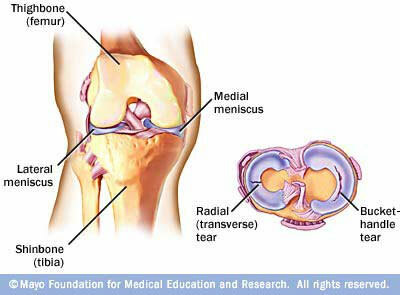 Nor am I saying that, if you have pain on the inside of your knee, it means that you have already torn your meniscus. You may simply be irritating it repeatedly in the same area. I’m actually finishing this newsletter up in Savannah, GA while doing a week of Mysore Classes at Savannah Yoga Center. There are two students with pain on the inside of their knee and both seem to be more hamstring or adductor related. Good assessment is the key and that goes way beyond the scope of a newsletter. There are of course other structures in this area that can get inflamed or irritated and cause pain on the inside of the knee. Some of these structures are the medial collateral ligament (MCL), various muscles crossing the inside of the knee and even the joint’s capsule can get compressed and bothered. The reason I lean toward the medial meniscus compression is that I have heard so many stories of knees popping when in the lotus position. Swelling in the back of the knee and sometimes a regular clicking sound often follows the pop. It’s also possible that the knee will lock intermittently after the original pop happens. All of these are classic signs and symptoms of a meniscus tear. The best way to confirm whether the meniscus has torn is to go to the doctor and have an MRI taken. What is the Meniscus anyway? There are two separate pieces of cartilage that make up the meniscus in each knee. Each is an additional piece of cartilage that sits between the femur and the tibia. These are of course the two bones that come together to make the knee joint (femorotibial joint). This extra piece of cartilage serves a couple of functions. One is to add cushioning to the joint and the second is to help with the function of the joint: allowing the knee to flex, extend and rotate in the ways that it does. Each side of the meniscus is more or less crescent shaped and sits on top of the tibia, an area referred to as the tibial plateau. One of the meniscus lives on the inside (medial) and the other is on the outside (lateral). Therefore we have what we call a medial and lateral meniscus. You can further divide them front to back, which in anatomical terms is anterior (front) and posterior (back). The area of the meniscus that is most commonly torn is the posterior portion of the medial meniscus. This also seems to be the area most affected and most commonly injured in the lotus scenario we’re talking about. If the meniscus tears, can it heal? This is perhaps the most common question. Unfortunately the answer is a little complicated. The answer depends on where and how badly the meniscus is torn. In general (there are always exceptions) tears that occur to the outer edge of the meniscus can heal on their own. The reason for this is that there is a small blood supply that feeds this outer edge and can help it heal. The inner part of the meniscus normally doesn’t heal on it’s own (there are always exceptions). It is when the tears are in this inner area that surgery could be required. It’s also possible that a tear is small enough that one can live with it without needing surgery for quite some time. But keep this in mind, joints are meant to function with almost no friction. A tear in the meniscus is an area where there will be an increase in friction, hence it often causes irritation, swelling and pain. This friction can do a couple of things. It can lead to the tear growing in size and it can also damage the cartilage on the femur that has to slide over the torn area. Why is the medial meniscus getting compressed? There are two movements that when combined would put the most amount of pressure on the medial meniscus. The two movements are flexion of the knee and internal (medial) rotation of the tibia. In lotus both the femur and the tibia have to rotate externally. If the tibia doesn’t have enough outward rotation, there still could be enough in the hip to make up for it, or vice versa. If however both the tibia and the femur lack in their ability to do external rotation then what you have is more internal rotation, which by itself can put pressure onto the medial meniscus. When you combine this with the knee being flexed, as it is in lotus, you end up with even more pressure on the medial meniscus. 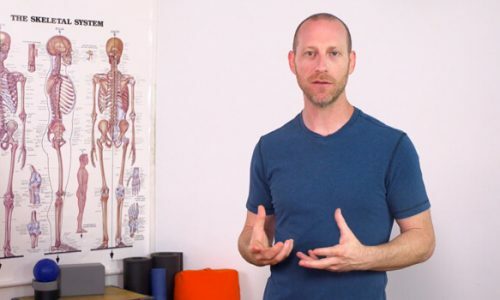 If you have pain on the inside of your knee, the simple test to see if it’s a rotational issue is to rotate both your upper and lower leg externally while in lotus (be careful not to push your knee toward the floor too strongly). I’ve covered this aspect extensively in the knee section of YogAnatomy Volume 1. A section is also available at the bottom of the YogAnatomy home page. This section also shows you other options for what you can do if you already have pain on the inside of your knee (you can also pay for and download the entire knee section here). 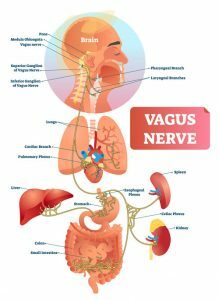 I talk more about what is required of the body to move into a pain free half-lotus or lotus pose on pages 279-284 of my book Functional Anatomy of Yoga. What if you have pain on the outside or in the centerline of your knee around the patella? No, I didn’t forget. If you have pain on the outside of your knee, you’re in a club of your own. When I meet people who have pain here, I often find (there are exceptions) that rotation internally of both tibia and femur results in a decrease in their pain (the opposite of what to do if pain is on the inside). Upon further questioning, many of these people are or were runners or cyclists. My hypothesis at the moment is that a tight Iliotibial band (ITB) is the culprit (I’m sure there are exceptions). The ITB seems to be placing some type of rotational force on the knee that is causing pain. I assume it’s rotational in nature because when I rotate the femur and tibia internally, the pain is reduced or goes away. If the pain is through the midline of the knee I tend to focus on the quadriceps group of muscles first. Either they lack flexibility or they lack strength and either of these could be causing trouble in the knee. I realize that this is unspecific but the actual assessment of the person would be necessary to determine which is the case and what should be done. The reason for checking the quadriceps when the pain is through the centerline of the knee is because this group of muscles literally wraps around the patella to get to its final destination on the tibia. Therefore it is intimately associated with the functioning of the knee particularly in straightening (extending) the knee. Having said that, there are a number of other issues that can show up in and around the patella, including arthritis and build up of scar tissue under the patella itself. I’m definitely not an advocate for unnecessary surgery. Only you can decide what to do with your own body. If you have a torn meniscus and know it and have been avoiding surgery there are a couple of things you should keep in mind. One is that the success rate for removing a small piece of meniscus is very high, around 90% perhaps higher. This means that the surgery doesn’t lead to any further deterioration of the area and wouldn’t need surgery again. If it’s a large tear and a larger piece is removed, this percentage drops. Finally if the type of meniscus surgery is done where the meniscus is stitched back together, the success rate drops to about 65%. Another thing to keep in mind is the potential secondary effects of leaving a meniscus tear untreated, such as an uneven wearing on the cartilage in the joint, particularly on the femur. This could potentially lead to arthritis in the long term. Hi thank you for this article! my doctor said, to try to avoid the operation taking care of the problem, during a healing period of 6 months. however, Im alway scare, that is not healing and to have a problem on my cartilage joints (as you mention). Sometimes it hurts and sometimes not. my muscles seems to be very strong to the point the take out some of the pressure from the meniscus. when is the right time to get the operation? I can’t say when the “right” time is for you to have surgery. It’s a difficult decision. I’m going to guess that if the doctor is telling you that it is a 6 month recovery that you have a large tear. The method of repair for larger tears is to essentially stitch them together. This requires the knee to be immobilized for about 6 weeks. Small tears do not require immobility after surgery. It’s up to you to decide how bad the tear is, as in how it is effecting your daily life. Does it impede you from doing things you want to do? Difficult to decide… for sure. Some day i would probably need an operation. As I understood that´s a Fact. My uncertainty: If I wait until i am older to get the surgery done, maybe I increase the chances of Arthritis? At the moment, i feel ok, minor pain one in a while. My legs feel strong and slowly my hips find themselves more open, bringing less pressure on the knee. I realize that lotus seems more possible because of the hips being more open. Nevertheless the problem of rotation on the tibia will never be possible, I assume. Ardha Baddha Padmottanasana or Marichyasana B feels impossible! i bought chapter 5-6, its great! thank you for this. forgot to add to the end of the post, that I used to train for a marathon and from there comes the meniscus problem. Flat feet and the wrong shoes, I guess. I’ve tried the external rotation to no avail. I know you’ll be passing through here soon, but in the mean time for those of us who have adductor or hamstring related issues what would you recommend when working on half lotus. I have added fire log, and an IT band stretch to my nightly routine in the hopes of loosening the hips enough to allow for a more comfortable lotus. However, I find that in my morning practice I have to lay off the half lotus positions in favour of my knees. Where is it that I will be passing through? At this point I would have to have a lot more details and probably physically see you to assess what the problem could be. It’s certainly true that external rotation isn’t always the answer. Edinburgh, UK I am hoping to get a spot in your one week Mysore. I think that in my case observation would go a long way. Today my knee pain is rarely present in yoga, obviously i feel a slight discomfort in lotus (thus I barely do it). But I also feel it Warrior 3/Twisted Triangle or in any right leg standing balance pose in which my hips are square. The pressure due to the extra weight bearing on the inner part of the right knee can be very tricky. I mainly wanted to reply to this post to share that I have noticed a very significant reduction in pain by taking an OTC joint formula. I have been taking Nature’s Bounty Flex-a-min Triple Strength Joint Flex Formula with Univestin plus Vitamin D + MSM. I began feeling the difference within a few weeks and now I can even jog again without the knee soreness. Hey David, I am stopping *everyone* at marychi d if they cannot bind. 1) to allow the method to do it’s work 2) to be consistent with what i’m teaching… I have had some severe reactions, even tears. I feel this is the best way (too much to say here)! Would you mind posting your thoughts on this and share your opinion on what you would do with students going perhaps ‘too far’. thank you. Can’t wait to meet you! Quick reply is that postures such as Mari D require the openness to already be in the lotus part relative to the knee. Tears coming, is sad, ego getting bruised unfortunately. I often give people lotus work to do after they’ve given a pose like this a try. So they feel like they’re moving forward still. It’s a very tricky subject… the moving on when not being able to do a posture. It probably does warrant a full post. I’ll add it to my list. Looking forward to being in Edinburgh! Thanks for the excellent article. I am in the minority with the pain on the outside of my knee, and, yes, I am a cyclist. I don’t do yoga, but practice zen meditation, and after about 6 months of sitting in half lotus regularly while commuter-biking almost daily, I started to experience a constant low level pain on the outside of my knee that became especially acute after biking (I have since been sitting with the other foot up, and have been careful not to push it as much as I had been, so sitting hasn’t been triggering much pain). My painful knee cracks more frequently than the other one, and it also makes a funny quiet stretchy noise when I climb stairs. It still feels basically the same a year on. I haven’t treated it professionally because it isn’t interfering too much with my life (although I don’t bike very often anymore). I’m also a poor graduate student and probably can’t afford much in the way of treatment. Any recommendations? Exercises or stretches to help it? Taking into consideration your financial situation… I would recommend a couple of things. I always suggest stretching and opening the tissues. This is especially true in your case. My guess is that the tissues around the knee, meaning all the way back up to the hip are so tight that they cause more friction and compression at the joint than is ideal. I think this excess tension may contribute to the cracking and stretchy noises you hear. I can only guess about this though. In addition for self treatment I would recommend the Yamuna Body Rolling balls. you can find them on her site. http://yamunabodyrolling.com/. just google it. Another option is tennis balls or other balls that you might find at the toy store. use your body weight on top of the ball and roll through everything from your knee to the top of your pelvis. Check out Yamuna’s site , she has some good resources there and probably some demo clips about what i’m talking about. This is really great information and such a relief to find some advice. I’m a runner and I’ve been doing Yoga for about 6 months now. In the last two weeks (just when I started attempting lotus!) I’ve also started experiencing this constant low-level pain in my right knee. It seems to be centered around my knee (somewhat in the center to the outside, it’s hard to pinpoint) and radiates in a straight line through the muscle on the outside of my leg up to my hips/glutes and down to my ankle. Makes sense that it would be an ITB issue. I already know my hips are super inflexible, but I’ve been slowly opening them up. So I suppose I’ll add in some time focusing on ITB stretches and pull out those tennis balls I bought for rolling. Thanks again! The Lotus prep video is very helpful. Thanks so much for the information. I started yoga teacher training a month ago and have been primary series a lot more often. My knees started nagging me exactly with the same symptom as Daniel. I never had a problem on my knees before even in lotus. But my guess is that I have been doing too much yoga with not so perfect alignment. I can’t bind in Marichi D and my left hip float up a lot. I might push a little too hard when my hips are not open enough. Another thing is probably about the leg rotation. I notice today in primary series practice that I tend to externally rotate my legs and tighten my glute in many different postures. Definitely going to work on stretching to open the hips and internally rotates the legs when practice more. Thanks for the information! Also look for the blog post on preparation for lotus and give those exercises a try! The video is very helpful. I love fire log! Thanks so much! I have a slight meniscus tear in a right knee. I used to sit in full lotus for an hour with no problem but now half lotus is one so, though in 2 months of time since the accident I have gotten more limber and my knee got stronger but it still hurts when try to sit with folded legs. I really dont want to do a surgery and I believe that I can get my tear healed through exercise. Would putting pressure by standing with my legs bent for long periods of time help it and would stretching my leg in half lotus or close enough to it would pump more blood to it so it can heal? Would you recommend any exercises? There are many factors that go into whether or not a meniscus tear can heal. It is possible that if you back off of folding the leg completely that the inflammation will calm down. As for standing for long periods of time… If it were an ACL tear, I would say that strengthening surrounding muscles would help because it would add to the stability of the knee. This doesn’t apply to the meniscus as far as I know. Regarding sitting in half lotus or close approximation to “pump more blood to it…” It doesn’t quite work that way. Definitely movement is good as it forces the synovial fluid within the joint capsule to move to different areas. Only the outer edge of the meniscus keeps a blood supply anyway, and I’m pretty sure from what you’re saying that your tear is on the inner part of the meniscus. My suggestion, don’t fold it all the way for a couple of weeks… ice it, reduce inflammation and then start taking it further again, slowly slowly. Don’t try to fix it, let it have space to heal if it’s going to. Great article! Thanks for taking the time to write it. Quick question I could really use your advice on. I fall into the majority of the population with pain in my inner knee directly brought on by lotus. What i’m failing to gleen from the article is… what should i do?! Right now i’m trying to take it easy to reduce any inflimation i have, but how do i avoid this issue so i can still continue my practice? As an avid practitioner, lotus becomes fairly important in the Ashtanga Advanced Series and i need to work around this problem! There are two youtube videos that I have… the first is a segment from my anatomy DVDs… the second is a lotus prep. You may find that your knee pain is on the side of your tighter hip. Which means you need to bring the focus back to that hip and get whatever remaining tension might be there. Definitely modify for the moment to reduce the inflammation. I sat lotus for several years, some half, some full, depending on how my knees felt. At one point I pushed it a bit too far in full lotus, sitting for 90 minutes a session. As a result, a clicking sound occurred anytime I crossed my right leg, or squated to loosen up the knees/thighs prior to sitting. That continued for about 10 years, until a couple of weeks ago when…the clicking stopped! I thought, great, finally that’s done with. Well, that was a precursor to a bigger problem: felt a slight, painful pop while sitting a few days ago, but afterward it actually felt nice, like something released. What released may have been the MCL as the next day my knee was completely swollen, stiff, with little flexability. RICE-ing it now, will see in a few days after the swelling goes down what the real deal is. I think I have the same problem! I have hurt the inside of my right knee, maybe the meniscus, maybe a ligament? I can’t go into lotus on the right side any more, and it feels unsafe even sitting cross legged. There is quite a large bump which feels sore when I press it. I have been massaging it but that is all. It is really bumming me out because it really gets in the way of my practice. I have been having a break but it doesn’t seem to be getting any better and I don’t know what to do. When I was younger (from about age 6) my knee used to ‘stick’ or lock and it would be very painful. This started to happen less and less throughout my teens and then early twenties started to happen again (when I started practising). It hadn’t happened for a while and then last week something went, I don’t know if my arms were too high in the knee joint when rolling in kukkutasana. My hips had been a stiff leading up to the accident so maybe this is related. I would love any recommendations and advice. I am not sure what the problem is, I just really want it to go back to normal! I’m very sorry to hear about your knee. Since this happened when you were so young as well, there may be something anatomically different about your knee than the average person. This could be an underlying problem that gets aggravated when doing things not quite “right”. Personally I think that tight hips are a major influence in contributing to these types of knee issues. My suggestion is to not fold it, ice and see if it calms down enough for you to resume practice. Instead of fold your knee completely focus on hip opening postures. I’m sure you’ve seen my lotus prep video, if not, take a look. perhaps find a similar configuration of your leg in other poses and focus on the hip for the moment. I totally agree with you about the hip and think my knee problem must be related. My hips are still feeling tight and my knee’s not getting any better, so maybe when they loosen up again the knee will heal (positive thinking!). It’s strange as it really feels like something has come out of the correct alignment as every time I go to put it in lotus I can almost hear/feel the bone scraping the edge of the other as though it’s about to pop out. I am still practising, just making strange adjustments in all the marys (etc.) so I don’t put my right knee in lotus. I’m going to take your advice, and fingers crossed things will go back eventually! Just to add – one thing I have learnt through this problem, is that there’s nothing more important than your bones and bodily health!!! I would agree with the Physio… An MRI would give you the most amount of information. Clicking like you’re describing is often associated with the meniscus, maybe a tear, but only an MRI would say for sure. It might not be, just don’t know. As for the story about the leg length difference, these type of imbalances often lead to trouble long term. It might have nothing to do with lugging around bags. Possibly an anatomical difference. If you can, go for the MRI so you know what you’re dealing with, it’s just more information, not a conclusion of what you HAVE to do. I also suffer form a meniscus injury, on inner side of the left knee, MRI confirmed. the doctor believes that the injury was caused from the chronic strain on the knee due to ballet and yoga. i have been practicing yoga for 5 years and dancing for 9. although a surgery is not essential, the doctor advised me to stay out of yoga classes, for a couple of months. Combining abstinence from yoga with swimming, cycling and homeopathy, the pain was gone. When i went back to my ashtanga practice, it reappeared, although i was really careful with my knee. What would you advise me to do? Focus on your hips for the moment and don’t fold your knee completely in lotus type postures. If you haven’t seen it, perhaps check out this post. I feel that the pain is very small on the inner part of the knee it does help when i help with the rotation with either the towel method or the strap method. My question is more in the lines of healing and eliminating poses until healing is achieved (which I thought was possible prior to reading this article). I don’t feel, from the sensation, that the tear is anything but minor, i only truly feel it in poses where half or full lotuc is required, not when walking, or day to day activities. You mentioned that eventually a tear could lead to complications later on around the miniscus. So am i to assume that this tear, will never heal on it’s on because it’s on the inside of the knee? Just because you have pain on the inner part of your knee does NOT guarantee that there is a tear. My guess is that often the regular compression is probably irritating the medial meniscus as it gets compressed in lotus like postures. After all, pain is an indication of irritation, inflammation or potentially injury. Long term I do think the regular irritation can and often does lead to a tear in the meniscus, but not always. Minor tears on the outer edges of the meniscus can and do heal on their own. If you think that this is you, then the best thing to do is stop putting your knee in any position that brings about the sensation you’re talking about for a period of one to two months. Just don’t fold your knee completely on that side. If the towel or strap is enough to eliminate the sensation, than that should be enough as well, but there is no guarantee. If you’re not doing so already, I also recommend focusing on the hip as in the lotus prep video. I’ve practiced Primary for just over a year and now am up to the first 7 in Second. Up until recently, i have been able to do all of the Primary poses- no problem. About two months ago my knee “popped” doing Baddha Konasana and i had to straighten it to unpop. Painful for about 2-3 days. I laid off most knee-bending poses for a few weeks then began adding them back in gradually, or with modifications. Once in a while it still pops (both when i bend and externally rotate AND in deep squat like Pashasana) but never as intensely as that first time. Usually afterwards it feels “wobbly” My external rotation is there – super flexible. My worry and main question is whether i should be seen by a doctor. I’m curious as to how long i will be in this state of constantly modifying poses, not doing certain poses, etc. Not looking for a “quick fix” but i am a planner and goal-setter. (and as my teacher says, a “pusher”:)) No pain during normal day to day activity. I would suggest that you do go see a doctor and have an image, such as an MRI taken if possible. If nothing else it will rule out that you have done anything semi-serious. What might that be? It’s possible from what you say that you have torn a meniscus. Ligament tear, sounds unlikely from what you say but I certainly can’t diagnose you based on a comment on a article :). You may even find that you have a misshapen meniscus. I’m really not sure. How long it will take depends on what it is that actually happened and how much you “push”. Go slowly and get more information so you can at least make a well informed decision about what to do next. No bony injury seen . 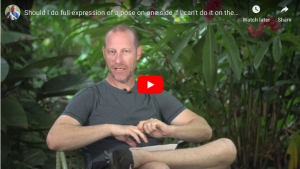 Now my questions are can I continue with the ashtanga practice , and what all to keep in mind not to injure the knee further , rather strengthen the adjoining muscles and ligaments to support the joint . I am still having the pain in my knee , Now whenever I do my practice I avoid doing lotus to avoid further wear and tear of the joint . In medical terms this is called osteoarthritis of knees . Please advise what all i should do and what all i shouldn’t do , as i want to continue with the practice , at the same time get relieved of this slight pain and shouldn’t be doing more damage to the joint . Can this knee problem be healed with the practice or managed ? I wrote to you before about some knee pain and popping and klunking that i had about 6 months ago. I finally visited an orthopedic (sports medicine) and was relieved to find out that i have an inflamation of the sheath surrounding my knee joint (plica syndrome? )…whenever my knee pops or klunks it just causes more inflamation. So, for now i am practicing but avoiding deep flexion, and trying to eat/drink foods that help inflamation. That is good news that it isn’t something more serious. I’m sure you’ve already heard about curcumin powder for reducing inflamation. great article indeed, very informative! I’ve started ashtanga 6 months ago and this is the first time that I’m experiencing some discomfort/pain around the knees. I’ve never had any knee problems so it’s strange and somewhat worrisome (and I’m generally a person who worries quite a bit about injuries). I’m quite sure it has to do with attempting to do full ardha baddha padmottasana and the sitting version as my hips are very tight and just started to loosen up. I think I will take a step back and not rush these postures. my question is however if there is anything I could do about the size of my legs. I have long limbs (this is the reason I was able to bind in these postures even though my hips were probably not open enough…) and my yoga teacher told me to try to put my feet higher up and more out to the side because my shins are longer than my thighs. there is no way I can put my feet to my navel when attempting the posture, for example, it’s more to the side. the problem with doing the posture this way is then my foot “bumps” into my pelvic bone, which results in a bigger rotation for the knee. I’m not sure I was clear enough but do you have any ideas I could modify these postures? the knee pain was on the lateral side and just generally “around” the knee, it if this piece of info helps. Thank you for this article, I am currently responding while having my Left knee under ice after being diagnosed with a meniscus tear. I have sent you an email with a question but thought your readers might be interested in another aspect to the knee. As a Holistic body worker I incorporate many aspects when treating my clients. So, finding myself with this injury, has given me an opportunity to look at other options. Also looking into other underlying issues that may have contributed to the meniscus tear. Thought I would share with you what I found. 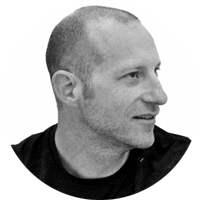 An Acupuncturist in New Zealand that works with Rugby players, doesn’t just treat the knee but also looks at the associated organs that the meridians are linked to, Kydney and Liiver are associated with the knees. It is interesting to point out that the emotions to those organs is stress, fear and guilt for the kidney. Anger and resentment for the Liver. By treating those areas with acupuncture can greatly improve the healing process of the knee. Just a thought. Thank you, David, for your unselfish sharing of these things with us the ignorant. I would really like to buy your book but I’m living without credit cards so for me it is more difficult to get it since I have to wait for special opportunities when some of my friends goes abroad or so. Until then, I’m reading a lot of your articles and I’ll try to follow the advices you’re giving. God bless you and may you live long and conscious.